Ever want to get away during the winter? The Garnets wrestling team did. So, Head Coach Joel Jenson and his staff decided to take the group south a week ago to participate in the Heritage Duals in northern Virginia. The team went 2-3 for the weekend, defeating the home team and a Stone Ridge squad while dropping matches to a trio of powerhouses. Individually, senior captain Tyler Webb and his younger brother Dylan both went 5-0 for the tourney. Heavyweight Peter Patouhas won four bouts and lost one, while senior Carlos Rodriguez was 3-1 in the 195-lb. class. 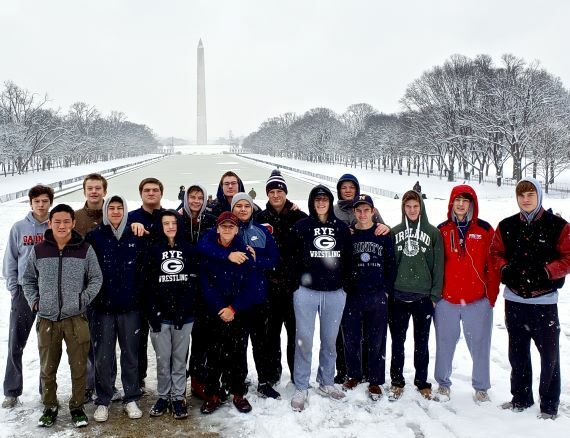 Off the mat, the Garnets found it tough sledding, literally, on a sightseeing trip to our nation’s capital. Three inches of the white stuff made the trip to the Washington Monument an adventure, and the government shutdown foreclosed a tour of the Smithsonian. Perhaps that’s why the Rye team seemed happy to be back at home Tuesday, January 15, even though the visitors, Our Lady of Lourdes, is one of the strongest squads in Section 1. Predictably, the Poughkeepsie team defeated the Garnet grapplers in all the contested weights up to 152. Tn that match, Tommy DeCaro pinned his man exactly halfway through the second period. In the highlight of the afternoon as far as the locals were concerned, junior Dylan Webb pinned his opposite number in just 18 seconds. Carlos Rodriguez was wrestling all even (2-2) when a quick move had him pinned three minutes into his bout. That pushed the team score to 52-18 in Lourdes’ favor. Then Dylan’s brother Tyler scored a takedown 30 seconds into his own bout at 220. He managed to flip his opponent onto his back and then press his shoulders into the mat, earnng the pin at the 67-second mark. A final forfeit by Lourdes at the heavyweight level gave Peter Patouhas a walkover win and the Warriors their 22-point final margin. Rye is now 6-7 on the season. The Garnets traveled to Byram Hills for a match Thursday, January 17, before Saturday’s Westchester County Championships at Yonkers High School.